Legendary country music songwriter Guy Clark is currently in a nursing home facility, but remains in stable condition. This information was confirmed by Saving Country Music through Guy Clark biographer, documentarian, and publicist Tamara Saviano. Reports that the 74-year-old songwriter had left the nursing home to enter hospice care, and may be in the final stages of life appear to be premature. Guy Clark has been suffering from numerous health ailments recently. In June 2015, he was hospitalized right before he was scheduled to appear at an Austin City Limits event being held in his behalf. Clark had a bad reaction to medication he was prescribed after a recent surgical procedure, and missed the ACL Hall of Fame induction. The induction ceremony continued on in Clark’s absence, and Lyle Lovett accepted the honor on Clark’s behalf. Music fans are on edge at the moment when any news of an ailing artists is heard. The high profile passings of music stars in country music and beyond has been unprecedented in 2016. Along with recording his own music, Clark has written songs for Johnny Cash, George Strait, Alan Jackson, Ricky Skaggs, Vince Gill, The Highwaymen, Jerry Jeff Walker, David Allan Coe, and even current stars like Brad Paisley and Kenny Chesney. Guy won the Grammy Award for Best Folk Album for My Favorite Picture Of You in 2014. Tamara Saviano has been working on a book and film on the life of Guy Clark called Without Getting Killed or Caught, which is hoped to be released to coincide with Guy Clark’s 75th birthday in November. One of the songwriting greats. Here’s hoping he makes a full recovery from whatever is ailing him. Praying for a speedy & full recovery. Clark has written many great songs over the years, but “Desperados Waiting for a Train” is among my favorite songs of all time. They don’t make ’em like Guy Clark anymore. I hope he beats whatever he’s got. I’m sure there are more songs inside him. So sad when our legends prove to be all too mortal. Hopeful for recovery! Be well and rest easy, Guy. We’re all rooting for ya. Susanna died 2 or 3 years ago. I think guy’s health has gone down more rapidly since then. Legendary talent! Hope that you’re on your feet again, soon, Guy. Appreciate the update on Guy. Total legend. Praying for recovery. My family are huge fans. Guy is one of a kind, and his music has meant so much in our lives. We love you, Guy. Praying for you Guy. You are my songwriting hero and my inspiration for being a songwriter. Hang in there and God Bless. GOD Bless you Guy. You are in everyone’s prayers and thoughts. Hey, Harold … many more years ago than I imagine either of us ever figured we’d have, I gave you a book about ‘Texas Stars’ … even had a picture of Linda Herrera & her gold Texas star inlaid tooth. Long, strange road, indeed, eh? Good to see your name, hope to see your face again sometime. I said a little prayer for him today. I’m pretty sure the first concert I ever attended was seeing him at the Sons of Hermann Hall in Dallas in the 80s. My mom introduced us to his music and my sister and I have loved him ever since. Guy, your “Good Friends” are legion, and we all want you back! First time I saw Guy was at The Family Hand. That was a few years ago! It was just the first of many nights of impeccable music at places like the Old Quarter, Liberty Hall, The Cactus Cafe and ACL . I’m blessed. Sandy, we most likely were both there at the same time! Hoping that “Old Time Feeling” comes back to you Guy! All of your Australian fans are hoping for a speedy recovery. Perhaps some “Texas cokcin’ ‘ or other Stuff that works” would help. Always sad towards the end of life’s short road. I was fortunate to see him in his prime in the middle 70’s ..he had it going on. Mr. Clark you leave a great catalog of songs for the world to continue to enjoy, all you have left to do now is look for the bright and warming light of God’s love. Back when the music started I watched Guy take apart a Stella guitar, do some fiddlin’ around with it, put it back together & it sounded like a Gibson. Maybe people didn’t know he had that skill set. He made a lot of “cheaper” guitars sound like a million dollars. He is a friend from a long time ago when we played at the “Jester” with “The Bayou City Boys”, “The Rum Runners, “Ken & Judy” etc. He was the same guy then as he is now.. An incredible talent. I want you to get out of there & here you sing “Things That Work” that you wrote with Rodney. Get better. You got some more Living to do. You changed our lives and we need you more than ever now. You know you have our love. We need you, you old desperado. Quit screwing around and get back to work. 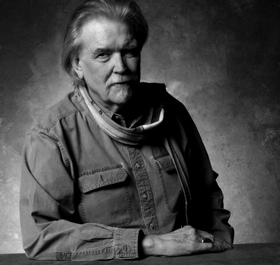 Songwriters like Guy Clark are national treasures, and I pray for his speedy recovery. I used to sit through both sets when Guy opened for Billy Joe Shaver, at the old J. Austin’s club in Nashville, in the early 80’s. They were great! Grateful for Guy and all he has meant to me. First saw him in Austin and saw him in Virginia Beach with my son when he was 9 (He’s in his mid 30’s now). I remember calling him at his home while drunk and how kind he was to me. I have to say that I love so many of his songs and albums but go back to “Let Him Roll” as probably my favorite. Also love “Boats to Build”, “Old Friends” and “My Favorite Picture of You:. Surrounding Guy in golden healing light and energy. Love you Guy! Your songs are the stuff I reach for when I fall. You’re simply the best. Please don’t leave us yet, we need you. Love, Orgirl1.